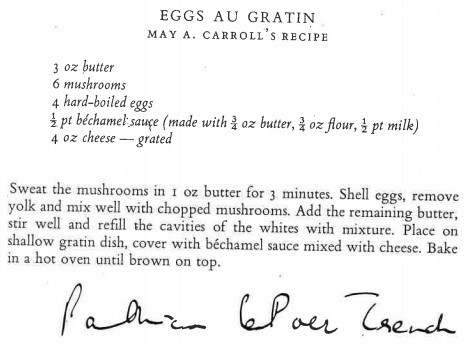 This Eggs Au Gratin Recipe was taken from ‘Irish Country House Cooking’, compiled by Rosie Tinne (1974). The book was discovered in a shed, and is one of a number of recipes featured from Woodlawn House. I do in fact have this book and never thought of mentioning it to you. The recipes are from the time that Derek le Poer Trench owned Woodlawn. The dishes are not exactly haute cuisine by today’s standards!! How times and food have changed.